Technology isn’t so much a solution in and of itself – it doesn’t “fix” things just as they stand.Â It’s moreÂ for theÂ facilitation and expediency of exchanging ideas, maybe even partnerships. They last for a moment, a short time or even permanency. The wider a technology like the internet has spread – the wider your range of audience. The wider your sample, the larger uncertainty of your target. In short, there are a lot of crazy people on the internet. That being said, I’ve found all my furniture through Craigslist. I’ve also found all my roommates through Craigslist (I’m not one of those “room with anyone already associated with your life”-types-of-roommates). It’s the single best resource that I can think of right now for a resident of Los Angeles. The thing about going on the internet message boards to find out about carpooling to Vegas with other volunteers for Obama is that you can’t find out too much about people by the two sentences they write about, say, when they want to leave and come back, or the kind of vibe they expect in the car for that weekend. Also, when there’s only one of two presidential candidates left to support – I know there’s that phrase, “Great minds think alike” but seriously? There’s left and right; there’s also nice and not-so-nice. Annoying and not-so-annoying. I think, though, that even with volunteering you do happen to narrow your sample because people involved aren’t just voters. They’re supporters and volunteers that would give up their time and pitch in a little (or a lot) to further something they happen to believe in. Without tootin’ the horn or anything, I had never thought that I would ever have enough motivation to participate in a general campaign. After all, that would take committing to something, or maybe even too much. That would be pretending – somehow – that the little (wo)manpower I could provide could actually make a difference. If you really feel the essence of what’s going on, live the life you aim to elect – carpool. Save gas, save the environment. You don’t just get someone elected so they can’t do all the work for you. In my carpool was a fifty-something Belizian woman with theÂ sweetest demeanor and the driver of the bunch, a forty-something high school art teacher who has been with his partner for 16 years. Their marriage is recognized by the State of California; their house, an absolutely divine ’70’s-style open concept with mod furnishings,Â floor-to-ceiling windows and new landscaping out back (oh, and a dog plus three kittens). We took turns driving and Rob was kind enough to enjoy our company, not charge us for gas – and even paid for our really pleasant, delicious Italian lunch between shifts on Saturday. Merilyn was the kindest, sweetest mother figure of the group. She showed so much caring. Did I mention that it was in the 60’s (degrees F) in Vegas? So as we went door-to-door to do our surveys it was actually pretty chilly with only our body movement to generate the heat we needed. I can honestly say that the work, while very tiring,Â was fun. The strong and not-so-strong reactions. The interesting conversations. Utilizing literature. Moving on to the next house after the door goes unanswered even though you knew you heard someone moving around inside. I should rewind back to lunch, though. We had decided against the first two establishments we had walked into and got back in our car and kept driving. The menus just didn’t look appetizing so we’d decide to look for another place. We turned into many plazas, glorified and unglorified strip malls. 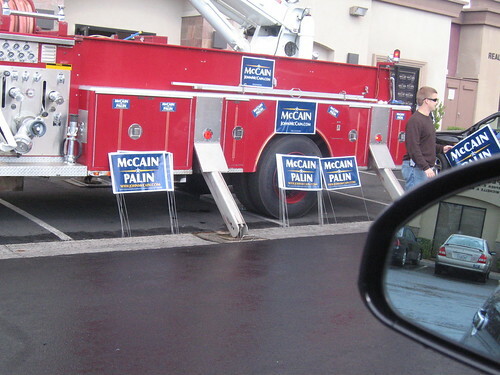 And then at one of the business parks full ofÂ attorney and medical practices, we realized that we had driven straight into the McCain-Palin campaign headquarters. What I wanna know is, How did they get a firetruck? Isn’t that a taxpayer asset being used for partisan purposes? Anyway, we had a play fight. It was as if we had deliberately turned into their territory, parading in front of them with our blue peacock feathers splayed out for all to see. We shared some moments of … jeering and laughterÂ … with a lot of “hooo” -ing and “hawww” -ing. They held up signs at our car, boo’ed at us; we held up our stickers up to them while laughing hysterically. The reality was that we were just looking for a good place to eat … while they then shouted, “Higher taxes!” at us. I was confused as to whether that was the best of what they had in their arsenal. Higher taxes for whom? When we turned into the inside of the plaza, we realized there was really no way out but the way we came. And so, we just went back through the McSame-Palin mob. I suppose now it just looked like we were just trying to be jackasses. They pretended to put their stickers on our car. At one point, Rob (with his window already rolled down to hold up Obama bumper stickers/peacock feathers for all to see) stopped the car and asked a guy where a good place to eat was. He gave us directions to Gladstone’s. We didn’t end up eating at Gladstone’s, but it was a moment in political activism solidarity for the books. Yeah, we may not understand each other much, but we all gave up our Saturdays to do this. Not without its fun, though. Endless thanks to Jim and Jen for putting me up and showing me out. Also, for showing me surprisingly awesome small-plate Japanese food their budding Asian community has to offer. We also saw Santogold at the House of Blues after building our own burgers at The Burger Bar in Mandalay Bay. 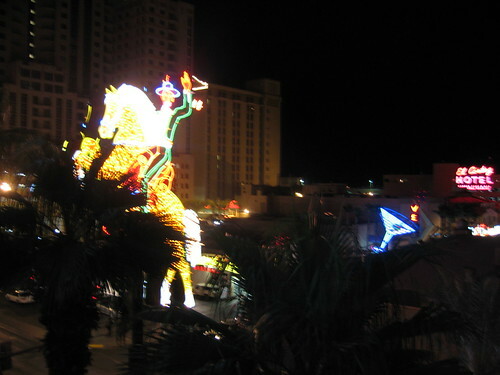 And then we went out in downtown LV, which has been undergoing a sort of revival. We checked out Downtown Cocktail Lounge, The Griffin and Beauty Bar. It was a nice change from the cheese you often find on the strip – more of a local, authentic vibe than inside the establishment of a huge casino club. 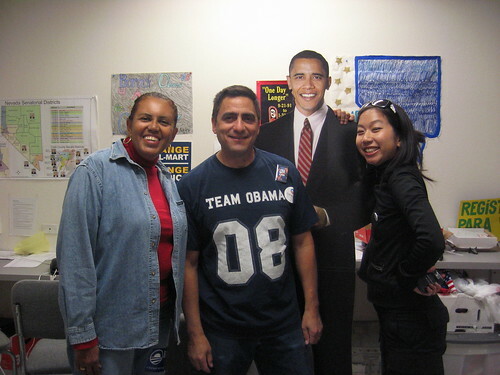 This entry was posted in In the life, Travel and tagged californians for obama, campaign, canvassing, las vegas, nevada, obama. Bookmark the permalink.